Many bends in the River Lea �were removed or by-passed in the nineteenth century to improve the navigation and to alleviate�flooding. But the sinuous outline of Essex Wharf survives. A foot ferry�known as�Smith's Ferry�operated from at least 1709 from the Jolly Anglers public house at�Middlesex Wharf across to Essex Wharf. 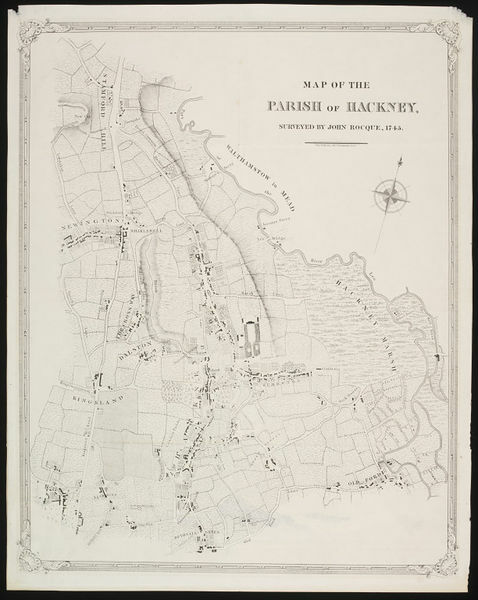 Essex Wharf was included within the boundary of�the Manor of Hackney�and the County of Middlesex. This may have been to ensure control of the rights to the ferry on both banks of the river. An alternative view is that the boundary was simply drawn through the centre line of a parallel watercourse.�Essex Wharf was bounded to the east by a side stream of the River Lea, forming a small island (also known as an 'eyot' or 'holm'). The southern stretch of this side stream as it re-joined the Lea just above Lea Bridge was developed as Lea Bridge Dry Dock�(later Izards Dock) from about 1746 1. 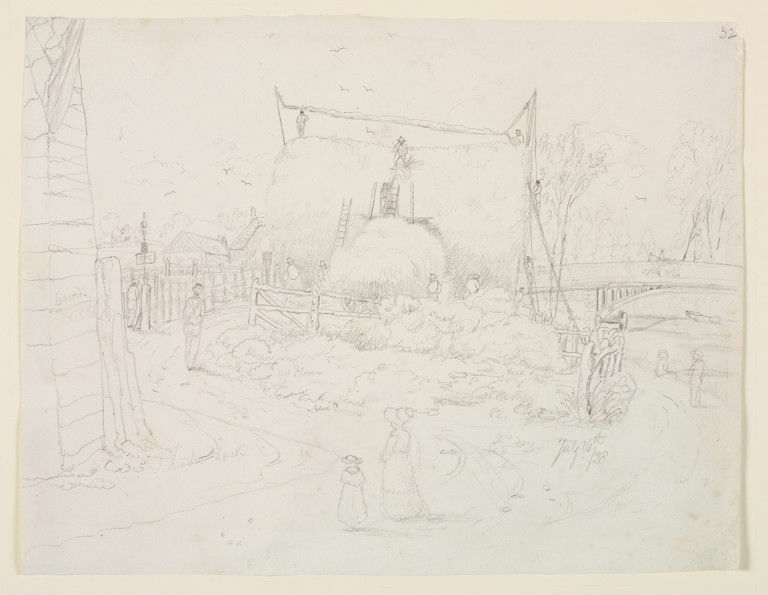 A riverside haymaking scene, possibly at Essex Wharf, is depicted in a sketch by Thomas Hosmer Shephard�of 1828 held by the Victoria and Albert Museum. The sketch shows the recently completed Lea Bridge of iron, which opened in 1820 (an alternative interpretation is that this is a view from the south of the bridge) 2. In 1847,�John Green purchased a boat yard, workshop and gardens at Middlesex Wharf along with land on the east side of the river with an associated right of way. This is probably land at Essex Wharf and the right of way may be the path to the ferry through Essex Wharf. The owner of Essex Wharf from 1894 until the 1920s was William Izsard (or Izard), a Wharfinger based on the River Lea navigation at Tottenham Hale. �There were six cottages. Alfred Izard of Essex Wharf, Lea Bridge had a distinguished military career serving in the 34th Company (Middlesex) Imperial Yeomanry during the Boer War�3. Essex Wharf may have also been occupied by the Eastwood & Co, cement suppliers, giving rise to the name Eastwood Wharf, at least for a part of the site. This firm operated four wharves in London in 1881 and supplied lime cement and 'rubber bricks' to the building industry. Rubbers are a type of brick which can be cut or rubbed into different shapes and were particularly suitable for forming lintels to windows and doors. Types of rubber brick supplied included 'chalfont bright red' and 'dark red'. Essex Wharf is currently undergoing redevelopment by the Dominion Housing Group. An archaeological desk based assessment was prepared prior to the redevelopment.�Read more.�(open a link to a PDF copy of the assessment).